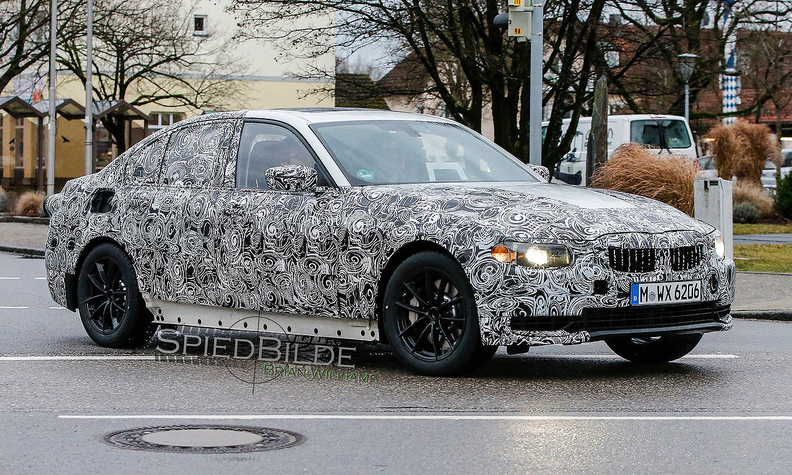 Spy photos show that the compact BMW 3 series sedan will take styling cues from the redesigned 7 series flagship sedan and have a sleeker look than the current model. SAN LUIS POTOSI, Mexico -- BMW will revive North America output of its best-selling U.S. model when it begins producing the next-generation 3-series sedan in a new factory here starting in 2019. BMW plans to build as many as 150,000 3-series cars and possibly another vehicle annually at the plant, its second North American manufacturing hub and where the automaker plans to invest $1 billion. The 3 series, one of the top-selling luxury cars marketed in the U.S., will be redesigned in 2018. BMW builds the 3 series sold in the U.S. now in Germany and South Africa, but South African output will cease when the Mexican plant comes online. BMW joins other European manufacturers in building factories in Mexico to take advantage of low-cost labor, a growing supplier network and free-trade pacts. An estimated 70 percent of the vehicles to be produced at the Mexico plant will be sold in the NAFTA region, BMW officials say. The company, according to media reports in Mexico, received $236 million in local aid in return for a commitment to create 1,500 jobs and invest $1 billion by 2024. Under the deal, the automaker will not be required to pay state and local taxes for 10 years, Mexican economic development officials said Wednesday at a briefing. BMW executives said the greenfield factory will take advantage of new sustainability technology to be environmentally friendly. The plant will have its own body, paint and assembly shops, but engines and transmissions will be imported from Germany as they are for vehicles produced at BMW’s Spartanburg, South Carolina, assembly plant. A groundbreaking ceremony for the Mexico plant -- announced nearly two years ago -- was held today. The paint shop, BMW said, will use reconditioned and recycled water and be the first of its plants to have zero process wastewater. Personnel from BMW’s Munich and Spartanburg plants will set up the Mexican factory. Employees from Munich, the lead factory for the 3-series sedan, will also train about 500 Mexican workers to be hired by 2019. Hermann Bohrer, former director of BMW’s Munich factory, has been put in charge of the Mexican manufacturing operation. BMW established a supplier and purchasing network in Toluca, Mexico, in 2008. Last year, BMW said its purchases from Mexican suppliers totaled more than $2.5 billion, 18 percent more than in 2014. Eventually, the company’s network of Mexico-based parts providers will be managed from a new supplier park near the plant site, BMW executives said. Mexico was the world’s seventh-largest producer of light vehicles in 2015, but only three European luxury brands -- Audi, Mercedes and now BMW -- build cars or will produce cars here. Volkswagen has been a leading producer of cars in Mexico for years. Ford is building a plant in San Luis Potosi and General Motors operates a factory near the new BMW site. U.S. sales of the 3 series line -- a sedan, wagon and the gran turismo -- have slipped 27 percent this year to 26,157 in a weak car market. The redesigned 3 series will use BMW’s CLAR modular architecture. Spy photos show that the compact sedan will take styling cues from the redesigned 7 series flagship sedan and have a sleeker look than the current model. It is expected to have semiautonomous driving features and improved handling and stability. The coupe version, called the 4 series, will continue to be imported into North America from Germany.